Great American Patriots come from all walks of life, including soldiers, volunteers, entertainers, and philosophers. No single philosopher since the Founding Fathers has had as much of an impact in reinvigorating world interest in the principles the United States were founded on than Ayn Rand. Toward the end of the Enlightenment, some of the greatest political minds converged in the 13 American colonies to create the longest-standing, most successful free nation in the history of mankind; United States of America. The ideas United States were founded on were based on the revolutionary concept that government's power is derived by the grace of its people, with the sole function of protecting individual rights. As nations have continued to experiment with collectivist forms of government since then, the United States have come under constant intellectual attack for these principles and for the resulting moral, economic, and military leadership. Through her novels, speeches, writings, and the many organizations throughout the world which celebrate her ideas, Ayn Rand continues to offer a solid defense to thwart these attacks ... reason. 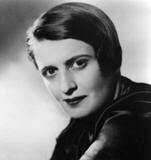 Ayn Rand was born Alisa Zinov'yevna Rosenbaum on February 2nd, 1905 in St. Petersburg, Russia. Her family fled to Crimea when her father's pharmacy was confiscated by the Soviets in the Russian Revolution in 1917, but they eventually returned to St. Petersburg where she studied history and philosophy at the University of Petrograd. In 1926 when she was 21 years old, she emigrated to the United States vowing never to return to Russia. Until her death in 1982, she developed and detailed her philosophical system in her novels which include the best-selling works Atlas Shrugged and The Fountainhead. Referring to it as "Objectivism", her philosophy advocates an objective reality based on reason, individualism, capitalism, and freedom. She passionately opposed all collectivist forms of government including socialism, communism and fascism. She rejected altruism as an insult to the heroic nature of the individual and opposed all systems which are not based on reason. Her novels continue to sell half a million copies each year, and are often reported as among the most influential books throughout the Western World. In 1949, her novel The Fountainhead was made into a film by King Vidor starring Gary Cooper and Patricia Neal. You have chosen to risk your lives for the defense of this country. I will not insult you by saying that you are dedicated to selfless service--it is not a virtue in my morality. In my morality, the defense of one's country means that a man is personally unwilling to live as the conquered slave of any enemy, foreign or domestic. This is an enormous virtue."